Stella Myles is impoverished through a family crisis and is forced to make ends meet by selling herself as a dance partner in a Piccadilly ballroom. 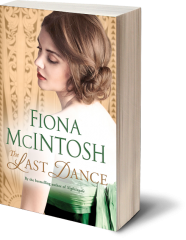 Here she meets the enigmatic Montgomery, who orchestrates a job for her as governess with the wealthy Ainsworth family in Sussex. But at Harp’s End, nothing is as straightforward as it first seems. Stella encounters a family with more secrets than most, and struggles to fit in above or below stairs – although nothing proves so challenging as restraining her emotions for the mysterious Douglas Ainsworth. When he announces that they are all to voyage aboard a cruise ship bound for Morocco, tensions reach impossible new heights. Stella is caught up in a family at war and in a world on the edge of another. She finds herself with an incendiary document that’s been smuggled out of Berlin, which she must get to London at all costs. From the rolling green hills of the Kentish Weald to the colourful alleys and bazaars of Morocco, this is a heart-stopping novel of romance, intrigue and danger – and a passion to risk dying for. Do you need book club reading notes? 1. In the opening pages of the novel, Stella whispers to her parents’ caskets: ‘Love like yours can only end in heartbreak.’ Did you think these words foreshadowed any kind of tragedy? 2. In Rafe’s attic study Stella finds butterflies pinned to a board. Discuss the symbolism of this in relation to the two main characters. 3. Rafe seems an entirely different man when out on the Weald or in the desert. Discuss the various internal and external settings of the novel, including the cruise ship. What role did these settings play in the events that unfolded? 4. As a character, did you love Georgina or loathe her? 5. Discuss the differences between Stella’s middle-class upbringing and that of the Ainsworth children. Do you admire the Ainsworths, for all their indulgent ways? 6. Was Stella right to follow her heart, given the circumstances and the prevailing mood of the era? 7. Rafe tells Stella: ‘I’ve not been lucky to meet anyone who stirred my emotions into the perfect cocktail until I danced with you.’ Discuss the ways in which you think Rafe and Stella are perfect together. 8. Which do you find the single most evocative and memorable scene in this book? 9. Was Rafe’s ultimate act ‘right’ or ‘wrong’? Would you have done the same? 10. Do you think this novel had a happy ending or a sad one?